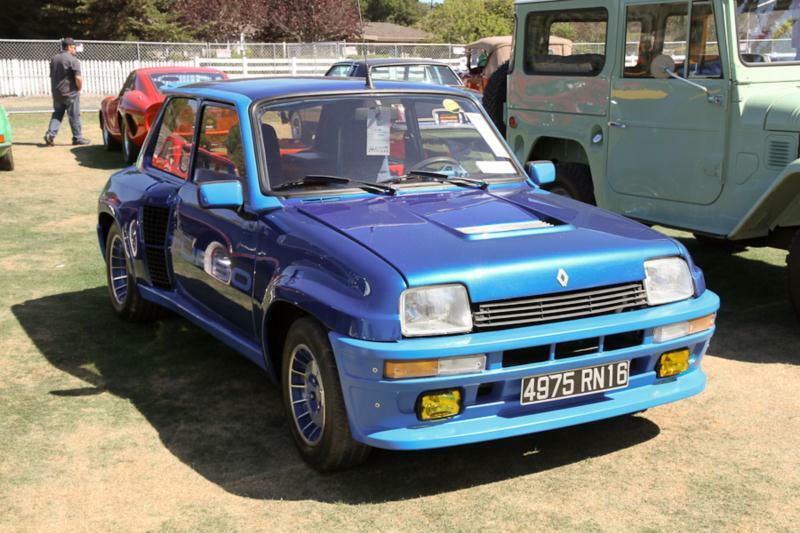 By the late 1970s, the Renault 5 (or Le Car, en francais) had established itself as a competent little runabout on the streets of Europe, as well as a decent performer in Group 2 rallying. Renault was on the verge of revolutionizing Formula One and sports car racing with its tiny turbocharged engines, but the company had not been successful at the highest levels of the World Rally Championship since the days of the Alpine 110, a fact it aimed to rectify. Bertone radically restyled the R5. The front-mounted, 63-hp, 1.4L four driving the front wheels was replaced by a modified and heavily turbocharged 1.4 placed amidship, now producing about 160 hp and driving the rear wheels. Though the new car retained the same basic profile, it was bulged, protruded, and vented nearly everywhere, and only the door panels were shared. Production began in the spring of 1980 at the Alpine factory in Dieppe. Four hundred cars were built to homologate them for Group 4, then the premier class in the WRC, and the R5 Turbo debuted that October at the Tour de Corse, steered home to an impressive fourth place finish. With a 40/60 weight distribution front to rear and producing nearly 400 hp in rally trim, the car proved quick and tractable, particularly on tarmac, and a first—and only—win would come the following season in the initial round, the Monte Carlo Rallye. The R5 Turbo’s success in the WRC was short-lived, however, as the all-wheel-drive and incredibly powerful Group B machines from Audi, Lancia, and others were on the way. Street R5 Turbos come in a few varieties, including those first 400 (dubbed the Turbo 1), which feature aluminum hoods and roofs, weigh about 2,200 lb and will hit 60 mph in around 6.5 seconds. Later cars, built between 1982 and 1986 (Turbo 2), have steel body panels borrowed from the standard R5. They featured upgrade kits from the factory that pushed power to 185 hp and then 200 hp, and in Maxi 5 trim, to around 350 hp. Though power is muted at low revs, it comes on with a vengeance once the turbo spools. Four-wheel disc brakes do an admirable job to halt forward progress, while the car’s race-tuned independent suspension and heavy rack-and-pinion steering provide ample feedback at speed. R5 Turbos ride on Michelin TRX radials. R5 Turbos are a rare sight on these shores, thanks to an awkward partnership between Renault and American Motors Corporation, which ended in 1987 when Chrysler absorbed AMC. It is estimated that no more than 25 Turbo 1 cars came here, and only about 250 Turbo 2s. Still, as the “hot hatch” segment continues to grow both here and abroad, it’s worth considering the valiant development effort Renault devoted to its lowly little Le Car to transform it into a rocket ship for the road. Never was a small car so big.